I've loved reading your comments about my ixnay on the ugarsay. Hopefully a few of my fellow wish-they-had-more-energiers will join me. Don't worry, we get a free pass to eat as much chocolate as we want on Valentine's Day. My second part of living like a kid is a little trickier. It has to do with joy. More specifically, it has to do with laughter. When was the last time you laughed so hard you fell off your chair? For Child #1 it was last night when I sang Katy Perry's "Last Friday Night" in my mama pygmy puff voice. A picture, for those of you unfamiliar with pygmy puffs. For me, it's been a while. I laugh, but often it's more of a muted kind of affair, as opposed to the full-out, shrieking, fall-off-of-your chair type of laughter. She was a great speaker! 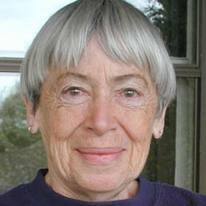 In fact, the last time I laughed until I cried was when I attended a local lecture given by Ursula Le Guin. I know Ms. Le Guin isn't known to be a humorist, but my laughter wasn't really her fault. It had more to do with the fact that I talked a friend into coming with me to the lecture. On the way there I rhapsodized about the way Ms. LeGuin's children's books changed my life and inspired me to write. My friend, who is very well-read, was surprised. "I don't remember any children's books by Ursula LeGuin," she told me as we were walking from the parking lot toward the speech venue. "Oh, you must have read them. You know, the whole Wrinkle in Time series." She stopped walking and grabbed me by the elbow. "Johanna, that's not Ursula LeGuin," she said. 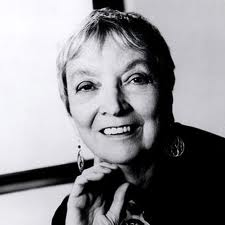 We pulled out our phones and quickly discovered it was Madeleine L'Engle. This discovery was funny, the kind of funny that made us laugh but continue on to see the lecture because we had both also read books by Ursula LeGuin. After we sat down I whispered to my friend, "I'm really sad I missed seeing Madeleine L'Engle. She was in Portland earlier this year." It was before the lecture started so she pulled out her phone again and a moment later she said, "Oh honey, Madeleine L'Engle' died in 2007." I like to think Madeleine L'Engle would have found this information as funny as we did. Some of the people in the audience, however, did not think it was funny to see two grown women laughing hysterically in the back row. The point to this story, aside from proving that I'm a complete doofus who doesn't know her L'Engles from her LeGuins, is the laughter. I wish I could laugh like that more often. But laughter is tricky. It's not something you can set out to accomplish, like stomach crunches or making your bed. It's spontaneous, and as such amorphous. Wish me luck! I'm hoping this part of living like a kid doesn't turn out to be my white whale. 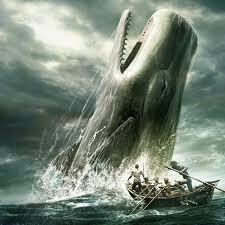 That one's Melville, right? I love stories like that--and friends like that to laugh with. That is the primary problem, I think--not enough time with those friends who can enjoy those really ridiculous moments. I have laughed a lot more since my two neighbors and I started our fitness plan and the key really is just 'girl time'. My husband is a 'laugh his head off' kind of guy. I have had to pause tv shows because he is laughing so hard we are missing things, wait for him to finish then turn the show back on. It makes watching those shows a lot more fun for me. I find I laugh out loud at stuff a lot more when I am with him. Great story. You made me stop and think. I tend to take life too serious sometimes and perhaps some laughter is exactly what I need. Maybe I'll rent some comedies this weekend. All the best. As a teenager, my best friend and I used to just lay on our backs and die laughing... We never knew what was going to bring on the hilarity, but it was just a given. I definitely wish I could get that back as well! Laughter is such a basic human reaction... Like when you have a 9 month old who--for whatever reason-- thinks it is absolutely hilarious for you to put something on your head and let it fall off. No one taught them the subtleties of humor, they just KNOW "hey, that's amusing" and some part of maturing must stifle that instinct unless you make a concerted effort to bring it back. PYGMY PUFF!!!!!! My kid had to get one of those when we went to the *sound of celestial choir singing* Harry Potter world in Florida. She still has that thing. Had to carry it around with her on Halloween, along with trick or treat bag, when she dressed up as Ginny. I'm really even-keel when it comes to emotions, so pure joy often eludes me. But I do know how to laugh! I love stories with laughter, even a mistaken death or two. It's OK. I'm one of those that if I'm laughing hard enough, I'll bend over. I love it when I laugh until I cry! oh my gosh, that pygmy puff is too cute!! lol...your mama pygmy puff voice must be a riot. And the Ursula LeGuin story is too funny! yes, laughter is all out spontaneous and wonderful too. For some reason, when I get together with my sister, and we get a case of the giggles, everyone needs to watch out...lol. Its BAD. All out tearing up and gasping for air laughter. It tends to happen to us in movie theaters, when everyone is quiet and the film is getting serious and emotional. The last time this happened was while watching the movie AUSTRALIA. Those suppressed giggles were so bad my sister sprayed her soda while trying to take a sip to calm down. She then turned to the shocked man sitting next to her and said "I'm so sorry, I have asthma" <-she doesn't have asthma, she just sprayed her soda all over the place and was apparently at a loss for words...lmao. We had to walk out of the movie for a few minutes to calm down. Nuff said. 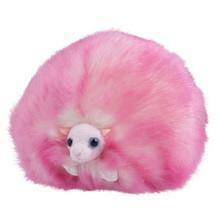 I forgot everything the minute I saw that damn Pygmy Puff! Reminds me of going to the Wizarding World, oh what a wild day! LOVED IT! Hart, girl time is key but finding the time is hard! I love that Rachel! My mom is a lot like that too. Thanks Andrea! Good idea, maybe I should do that too. Lauren, I LOVE baby laughter. It's so great and yes, when do we start to stifle that? Alex, maybe that's my problem. I'm not so even keel. Although it's good for the joy piece. Hi Nicole, love it when people do that! 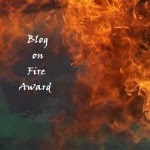 Naida, that's such a great story and see! You made me laugh!! Jen, all I can say is at least you don't have to pretend to be a mama pygmy puff!